5 Turbo Hermit Crab Changing Set. Great for Small to Medium Sizes Hermit Crabs. Shells include select Turbo Shells with clean and smooth round Openings, plus a pair of Fairyland Snail Shell with large D-shaped openings. All Natural Seashells, Aquarium Safe. Great for Larger Hermit Crabs. Shells include Moon Shells, Conch Shells and Land Snail Shells with clean and smooth Openings. All Natural Seashells, Aquarium Safe. Great for Larger Hermit Crabs. 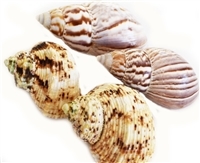 Shells include Rapana Whelks and Land Snail Shells with clean and smooth Openings. All Natural Seashells, Aquarium Safe. Great for Medium to Large Hermit Crabs. Shells include Rapana Whelks and Polished Turbo Shells with clean and smooth Openings. All Natural Seashells, Aquarium Safe. Opening Sizes 3/8" - 3/4"
All shells are 100% Natural, not painted or coated. Actual shell mix may vary. Great for Small to Medium Sizes Hermit Crabs. Shells include Moon Shells, Turbo Shells and Land Snail Shells with clean and smooth Openings. All Natural Seashells, Aquarium Safe. Great for Medium Sizes Hermit Crabs. Shells include select Turbo Shells with clean and smooth round Openings. Banded Turbo Petholatus, Banded Gold Mouth Turbo, Select Green Turbos. All Natural Seashells, Aquarium Safe. 10 Shell Hermit Crab Changing Set Medium Size. Opening 3/4"-1 1/2"
10 Shell Mix - For small to medium sized Hermit Crabs. Shell Sizes: 1" - 2 1/2"
This set includes 2 Fairyland Snail Shells, 2 Large Turbo Shells, 2 Whale Eye (Moon) Shells and 2 Shark Eye Shells. Great for Small to Large Hermit Crabs. Shells include Rapana Whelks, Land Snail and Moon Shells with clean and smooth Openings. All Natural Seashells, Aquarium Safe. Great for Small to Medium Hermit Crabs. Shells include select quality Turbo Shells with clean and smooth, round Openings. All Natural Seashells, Aquarium Safe. Perfect Mega Changing Shell Set for very small to medium sized Hermit Crabs. Great for Small to Medium Hermit Crabs. Shells include Green Turbos, Silver Turbos, Tapestry Turbos. Shells with clean and smooth Openings. All Natural Seashells, Aquarium Safe.